The Ampalaya, also known as Bitter Gourd or Bitter Melon is a vegetable that is either you love or hate. Just like Bagoong or shrimp paste, it's an acquired taste. Only if your mom served (or shoved) it to you as a kid in dishes like Pinakbet or Ampalayang Guisado will you have an appetite for it. But have you noticed why some dishes made with this vegetable are much too bitter and almost inedible, while others are just right on the money? You might wonder, is it a genetically altered bitter gourd? It is in the preparation using either one these two things, or a third choice using a different variety, so take your pick! Salting. This is a widely used method for drawing out natural liquid from vegetables. Salt is important when making sauerkraut, pickles and achara. Except iodized salt, you could use Kosher, Canning or any sea salt. First is to generously salt the sliced vegetable and then set aside for at least half an hour. You will notice that a lot of liquid will accumulate at the bottom of the container. Squeeze or press the vegetable gently to wring out excess liquid before rinsing. Rinse twice with water to remove the salt and wring out excess liquid. The bitter gourd is now ready for cooking. Blanching. To blanch is to briefly scald the vegetables in simmering water for a few minutes to slightly cook them, and then scoop them to an iced water container to shock and stop the cooking process. 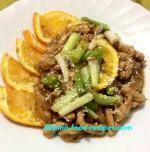 This method is not really widely used in a typical Filipino kitchen. The thinking is that this process takes out some of the nutrients in the vegetables. Nevertheless, this can help diminish the bitterness of the bitter gourd. 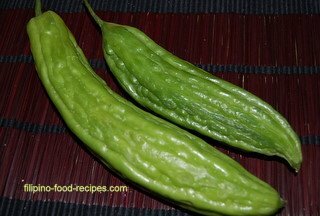 Lastly, if you don't want the extra work above, you can substitute with the Indian variety called Karela, as pictured here. 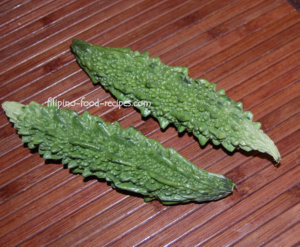 The Karela is very mild in bitterness, that it's like the dish is missing something if it is used by itself. So if you are bothered by the strong taste of ampalaya, use part-Karela to dilute the bitterness. They are prepared just as you would the bitter gourd, so you can skip the salting or blanching. In conclusion, bitter or not, just remember what your mom used to say when she was forcing you to finish your vegetable : it's good for you!